Imaging informatics offer a broad array of opportunities for those who seek them. Informatics tools are essential to medical imaging, and the cutting edge of these tools is often found in large, well-funded academic centers. But that doesn't mean that there is a lack of opportunities for radiologists who want to pursue their interest in informatics. In fact, with a little creativity, radiologists can find many avenues to explore. At the 2018 Society for Imaging Informatics in Medicine (SIIM) Annual Meeting, several radiologists talked about their experiences with informatics in a session titled, "The Expanding Role of Imaging Informatics Outside the Academic Arena." The session participants were cochairs Adam Kaye, MD, MBA, CIIP, a diagnostic radiologist at Advanced Radiology Consultants, LLC, in Bridgeport, Connecticut, and José Morey, MD, a radiologist and assistant professor at the University of Virginia (UVA) in Charlottesville and medical technology and AI advisor for NASA iTech, as well as David S. Hirschorn, MD, a radiologist and the director of radiology informatics at Northwell Health in Manhasset, New York, and Prasanth Prasanna, MD, a diagnostic radiologist for Diagnostic Imaging Associates in Salem, Oregon. Collectively, they shared tips for incorporating informatics in radiology practice in traditional and nontraditional ways. 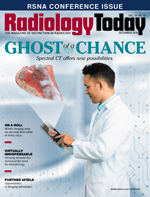 Young radiologists with an interest in informatics may be unsure where to begin when they move from residencies or fellowships to private practice, as starting a new job often requires treading lightly, at first. Kaye, whose practice includes 30 radiologists and covers two hospitals, says fitting in is a learning process, and young radiologists joining an established practice need to find a balance between being enthusiastic about larger projects and helping the practice in smaller ways. This approach will allow them to build social capital that they can spend later. "Being a young guy and coming into an established practice with a robust IT system in the beginning of my career, a priority was actually just latching onto what was going on and trying to help and give my input into things that were already happening," Kaye says. "You need to start with small things, start giving input where you think it could help, and eventually you can start working on larger projects. I've got something that I'm currently working with because I'm now starting to get involved in the rollout of projects instead of joining midway." Kaye says prior experience from residency or fellowships can demonstrate value to a practice. His practice uses the same dictation system as the one he trained on, so he was able to apply that experience to carve out a larger role. His training provided him with the background knowledge that the practice needed. "When I came here, I noticed that there was some standardization to what we were doing, but there was also a lot of free dictation and people changing macros to suit their own dictation styles and things like that," Kaye says. "And it became clear to some people early on that I was good with our dictation system, so I would sometimes help people with minor things in it, and eventually they asked me to be on the standards committee because they would like me to help revamp some of the macros. So even if you were 'just a resident' or 'just a fellow,' I think drawing on those experiences and helping in little ways shows where your strengths are to your new practice." Kaye says his work with the standards committee was an inroad to working on projects beyond reports and dictation. Helping in smaller ways where he saw an opportunity led to involvement in bigger projects on both the informatics and noninformatics sides of the practice. Prasanna agrees that training experiences can position new radiologists as a resource for their practice. During his fellowship at the University of Maryland, he worked to facilitate communication between the radiology and IT departments. His expertise with PACS and EHRs helped him contribute when he joined a private practice. In a marketplace where efficiency is always a consideration, radiologists who can perform multiple duties have added value. Prasanna recommends that radiologists who are interested in informatics get involved with the broader informatics community. He says SIIM, HIMSS, and the ACR have meetings, committees, journals, and blogs that offer opportunities for engagement. One of the ways that Prasanna stays involved with informatics is by sharing his experiences with radiologists in training, counseling them about ways to continue informatics work in private practice. He also lectures to radiology fellows about informatics once a year at the University of Pennsylvania. "There's a lot people can do," Prasanna says. "You get out what you put into it." Morey notes that there are also quite a few online learning opportunities. With the rise of massive online open courses (MOOCs), which are free online courses that anyone can take, there are plenty of options. "There are a lot of MOOCs out there through large academic institutions such as MIT and Harvard, among others, that can teach you a lot about informatics and machine learning, really high-level or low-level introductory stuff," Morey says. "At the University of Pennsylvania, Tessa Cook [MD, PhD, who is on Radiology Today's Editorial Advisory Board] has started an informatics program for residency [the National Imaging Informatics Curriculum and Course, which is cosponsored by RSNA and SIIM] that is easy to join, very inexpensively, so nonacademic institutions can get into it. I would leverage online sources to initially learn, whether you're trying to incorporate something specifically into your practice or learn about informatics in general." Another potential avenue is research. Those who don't have the time or resources to do their own research may be able to get involved with someone else's research. Prasanna says he joined IBM Watson's Medical Sieve and Grand Challenge team because it allowed him to do informatics research on the side while maintaining his busy practice schedule. Prasanna's work for IBM ran the gamut from data entry and helping to standardize lexical terms to writing code for AI algorithms to segmentation and annotation of images. Some of the work could be done while he was waiting for cases to load, other work he did on days off from the practice. Some of the work that he did was used to provide ground truth to train the image analysis algorithms. Prasanna says the research enhanced his radiology skills in many ways. "You learn about a lot of different diseases in medical school, and then in radiology you're learning about the radiology aspects of them, and sometimes you read review articles here and there, but [the Medical Sieve research is] kind of like going back to basics," Prasanna says. "You're going back to your foundations for a lot of data entry and data curations, and there are things that I learned a long time ago that I was reminded of. And now that I'm a little bit more removed from medical school, I can see the connections a little bit better." Prasanna says collaborations with industry can be useful for radiologists and radiology groups because they provide new perspectives on issues that may have become commonplace in radiology practice. They also provide potential outlets for entrepreneurial endeavors. He emphasizes that it's important to learn beyond what's needed for radiology informatics. Disciplines such as psychology, change management, business management, and philosophy are particularly useful, he says. Morey also advocates for learning outside the radiology and informatics domains, whether that learning is geared toward science or industry. In addition to his academic appointment at UVA, he works part-time at the VA Hospital in Arlington and at Eastern Virginia Medical School in Norfolk, logging one or two clinical days a week, on average. Outside of his work in radiology, Morey does work for NASA, Hyperloop Inc, and Liberty BioSecurity, among others. He feels that his cross-training experiences have enhanced his work on both sides. The critical thinking and ability to analyze patterns that he learned from radiology inform his other jobs, Morey says. Likewise, other fields such as engineering and biology inform his radiology practice. "Every other science that I study or field that I work on always gives me a new perspective and a new thought process on everything else that I do. It gives me a different way to look at it," Morey says. "When I'm in the hospital or I'm working on some sort of radiology AI project, I might take something that I've learned at Hyperloop, such as an interesting workflow that crowdsources different types of technology, and apply it. Or, when it comes to bioinformatics work that I might want to do in imaging, I might apply something that I learned from working with NASA. Those are use cases but, also, from a neurologic perspective, it's the way your brain interconnects and creates. The more you keep learning in different fields, the more neurons and connections your brain makes to be able to solve a new problem in a novel way." For those who are interested in exploring informatics outside of radiology, Morey recommends that they challenge themselves. He points out that typical medical conferences may be useful for learning about medical issues and making connections in the medical industry, but to stand out, it's necessary to seek venues that are not typical. "If you're looking to get into the tech world itself, the challenge I always give radiologists or residents at any level is they have to get out of their comfort zone. Don't go to your standard conferences because there's too much noise when you're one radiologist out of 10,000 or 30,000 people who are at a major conference. You really want to go to places where there aren't that many physicians or there aren't that many radiologists," Morey says. "You could go to South by Southwest or Google events or start-up events; those are the places where you're really going to stand out because you will be the one of a handful of MDs and probably the only radiologist who will be at that particular conference. If anyone at that event is looking to do imaging informatics or some sort of a health care start-up, then that's where you'll really shine." For those who prefer to stick with medical practice, Kaye says nontraditional measures may apply in that area as well. He notes that private practices are highly variable, and it's important to evaluate each practice critically. "If you're a resident or fellow looking to get into informatics in private practice, I think the important thing is to look for a practice like the one I found, where not everything is purely dollar driven, and the IT department feels like they can do projects that are necessary for patient care and necessary for working with our referring doctors and working with our community," he says.